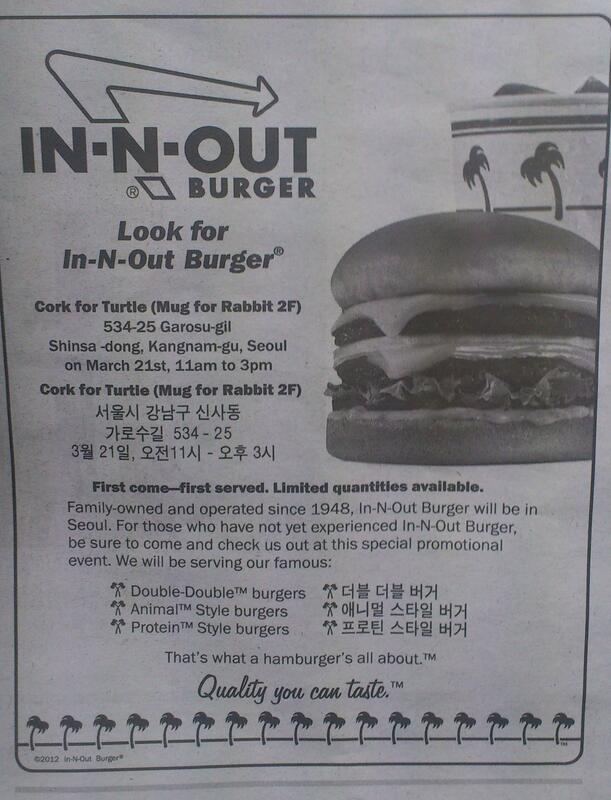 A couple weeks ago, our friends at Nanoomi tweeted a curious poster announcing an In-N-Out special event at a local wine bar (Cork for Turtle, upstairs from its daytime counterpart, Mug for Rabbit). At the time, although I was familiar with the In-N-Out on wheels in California, I had no idea that In-N-Out did this sort of thing, so I had to ask whether it was for real. It appeared to be legit, so that was that: previous lunch plans were scrapped and we headed out to Garosu-gil. The poster indicated that the In-N-Out popup shop would be open from 11am to 3pm, but having no idea what the demand would be like, I figured we should shoot for 11am. While the announcement was not made broadly or far in advance, the Garosu-gil and Sinsa-dong area seems to be something of a gathering place for U.S. born, raised or educated people, so I was expecting a decent turnout. However, what we witnessed completely blew away my expectations. The banner hanging out front tells us this is the real In-N-Out. We arrived a bit before 11am, but from far off I could already see that this was no joke. Promisingly, we spotted an employee resplendent in traditional In-N-Out reds & yellows, complete with the signature hat, apron and enormous safety pin. When we queued up, the line was already at least 100 deep. Minutes later, the line had doubled in size and curled around the block. Traffic had begun to snarl, due in part to dutiful pilgrims looking for parking (and rubberneckers wondering what could be so exciting). 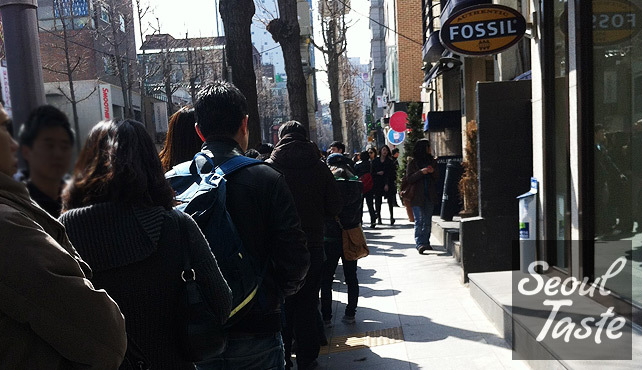 As expected, the chatter among line waiters was about half Korean and half perfect English. Every U.S. expat in the city and everyone who studied on the West Coast had begun to converge on Garosu-gil, and it was a madhouse. An In-N-Out concert? No wristband, no burger. By the time they started giving out wristbands (as with concerts), the line was already far too long, and some poor folks did not receive a wristband. 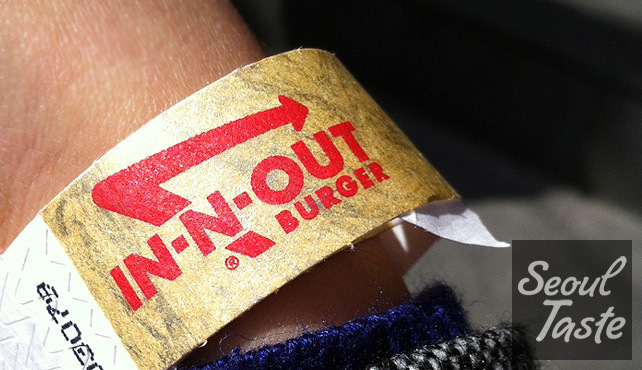 Without a wristband, there was no guarantee you would be able to place an order. So basically, by around 11:20am, all available burgers were spoken for. We were among those who received wristbands, so initially, we felt lucky that we arrived as early as we did, but we soon had other thoughts. From 11am to noon, the line barely moved at all. At some point, we heard that the grill they were using was so small that they could only cook 5 patties at a time. (When we finally got inside, this appeared to be true.) Someone in line suggested that we should buy them another grill or two and have them delivered by quick service so that we could all get our Double-Doubles faster. Meanwhile, as we all grew hungrier with every passing minute, all we could do was smell that signature In-N-Out sauce wafting down from upstairs. It was almost two hours after we arrived when we finally placed our order. In-N-Out's normally simple menu was even simpler (no shakes, and sadly, no fries either), although curiously enough, two of the off-menu styles, like "Animal Style," were printed right there on the menu. Prices were reasonable, a Double-Double, chips (no fries?!) and a drink went for 6000원 (well under $6, though I'm sure most of us would have paid anything they asked). There was no soda fountain, so they were pouring cans and bottles of soda into In-N-Out cups (somewhat wasteful, but it did enhance the In-N-Out experience). T-shirts were also available, but as they didn't say "Seoul" anywhere on them, I didn't feel compelled to buy one. Seating was limited, but the burgers were coming out so slowly it didn't matter in the least. Besides which, many folks had already spent much more time there than they had intended, and took their orders to-go. Well, if I only get to order one thing, make mine a double. 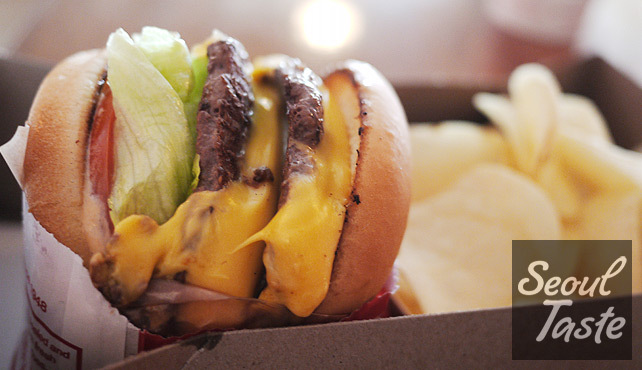 A Double-Double, that is (two patties and two slices of cheese, for the uninitiated). Annie got the double-double with grilled onions. Was it all worth it in the end? On the day itself, belly full of Double-Doubley goodness, I felt at least 80% sure it was. After a giving myself a day or two to forget the long wait and the heartbreak of receiving chips instead of fries, that certainty easily reached 100%. If you were in Seoul but missed it, don't feel too bad. Especially office workers: even if you had managed to get out of the office at 10:30 to line up right at 11 like we did, would you have been able to get away with returning to your desk at 2:00? 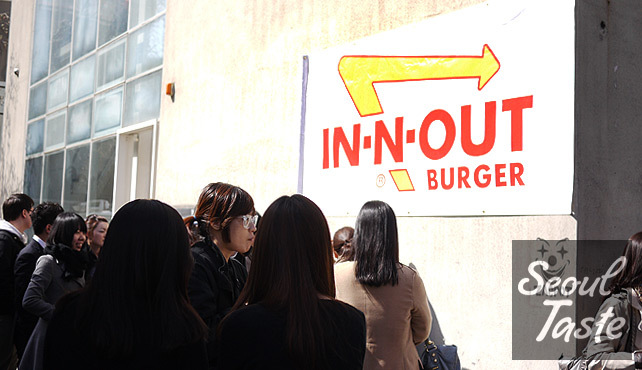 Does this mean In-N-Out is coming to Korea? In the short term, not likely. 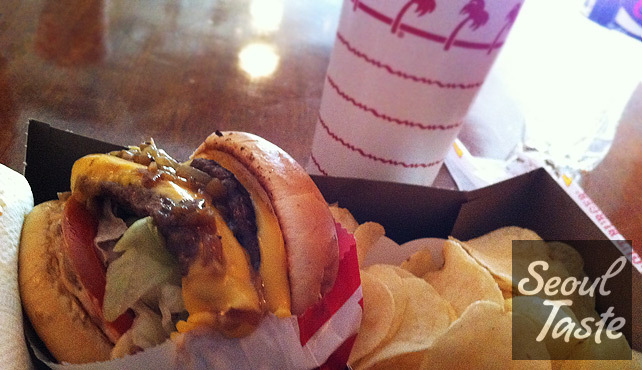 In-N-Out is expanding rapidly these days, but they still have only a tiny footprint outside of Southern California. I'm thinking that even with the incredible response to this minimally-publicized event, Seoul is probably not anywhere near the top of their list right now. Although I rarely make it out to Socal these days (it's a pretty long flight), I will almost certainly have my next Double-Double there. 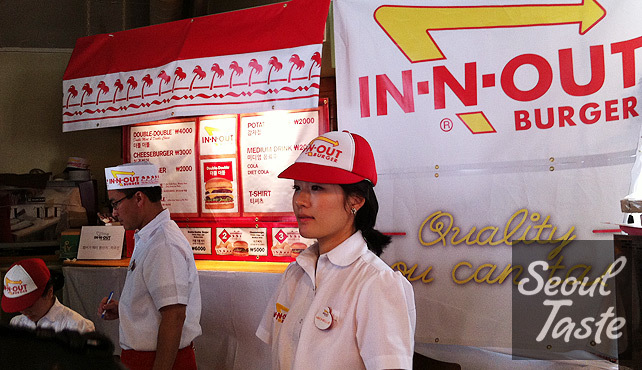 Still, I am hopeful that In-N-Out will step up to the challenge and open a few stores here in Seoul. After what I witnessed that day (in Garosu-gil, and on Facebook and Twitter), I am confident that they can survive and thrive in Korea.